The Australian Broadcasting Corporation (ABC) has updated its Android app to bring it in line with the iOS version, adding the ability to view radio and TV content and a number of other new features. Australia's national public broadcaster said the new app update was driven by a huge increase in use over the past year. ABC's Director of Innovation, Angela Clark, said in a statement that active usage of the ABC Android app has more than tripled over the last 12 months, signalling a "large shift" to Android. "Australians have a love affair with mobile devices generally, but we have seen a large shift to Android over the past year. We get a lot of feedback from our audience members asking us to produce more Android apps and we are putting more resources into mobile this year to enable us to better service all mobile users." According to Clark, Android users now represent 35 per cent of all mobile browsers on ABC's Web site. 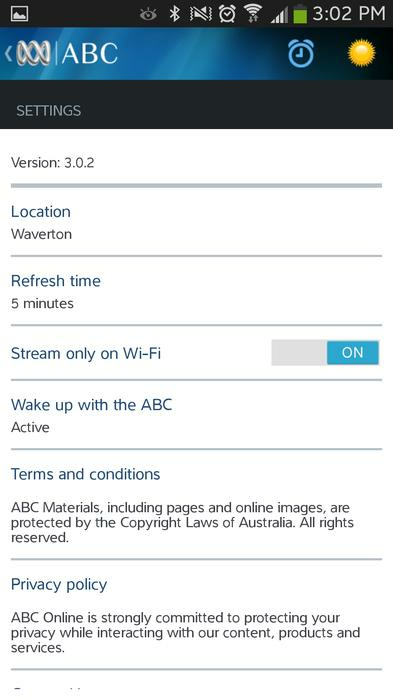 Among the new features of the 3.0.2 version of the app include the ability to view radio and TV content, and a 'Wake up with the ABC' alarm clock that allows users to wake up to an ABC TV or radio program. ABC says it has improved the presentation of news stories, adding audio and video, and introduced a new navigation structure that aims to make the app easier to use. 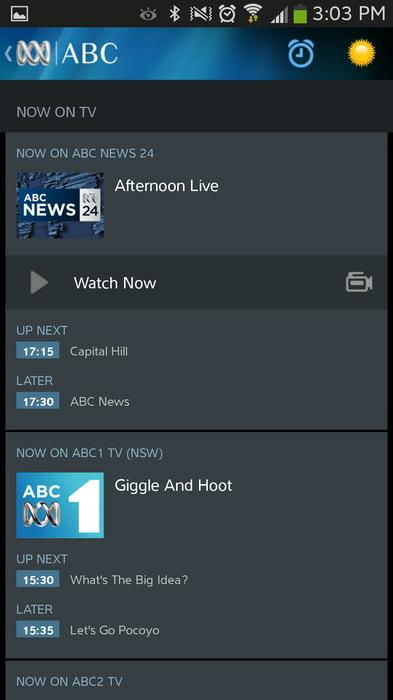 The app also allows users to watch live streams of ABC News 24 and see upcoming programs on its ABC 1, 2, and 3 channels. However, access to ABC's catch up iView service, freely available on the iOS app for iPad and iPhone, is still not available on Android. 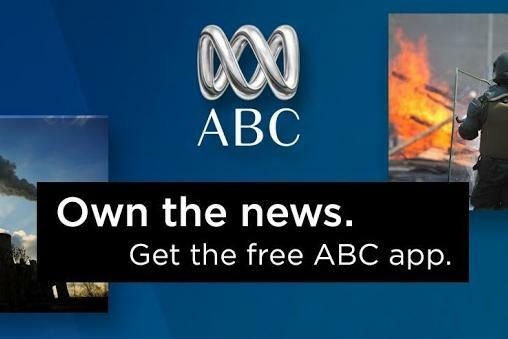 The new ABC Android app will work with smartphones running Android 2.2 (Froyo) and above and is available now from the Google Play Store. The current app will also work with tablets, but ABC says a tablet specific version "is already under production" and will be "coming soon". 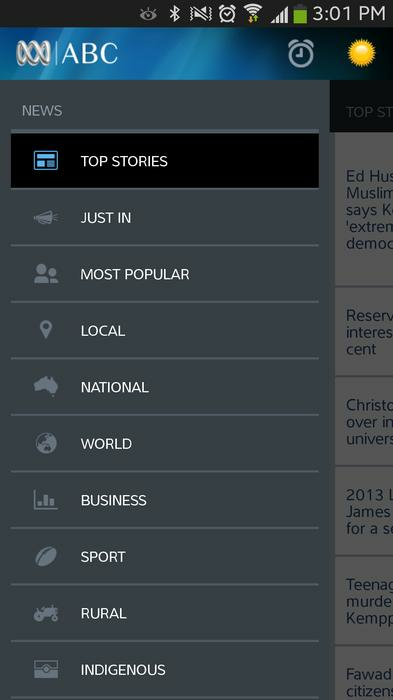 The new navigational menu in the ABC Android app. 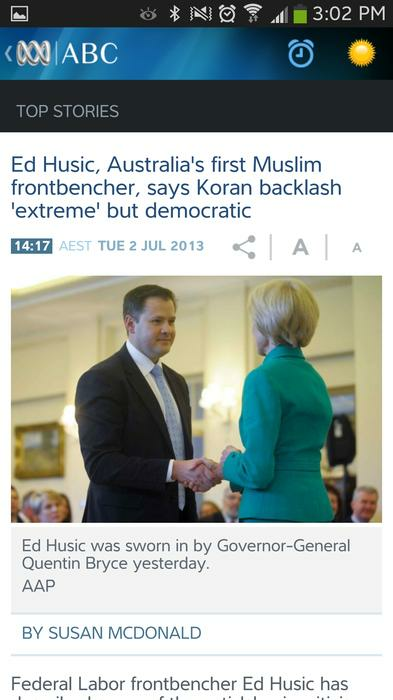 Reading a news article in the ABC Android app. Users can watch live streams of the ABC News 24 channel. The settings page of the ABC Android app.